Amazing label designing mechanism presents advanced printing facility that helps you to create own-style, trendy CD, DVD labels, holograms, stickers etc. CD DVD label creator software stores all generated business cards, ID badges in different file patterns such as gif, png, bmp, exif, tiff, emf, jpeg, wmf etc. Industrial tag generator tool generates wide range of audio/video CD labels, ID badges of various color, design, style, shape, dimension, density, font etc. CD DVD label creator software is specially designed and developed to produce wonderful, rich quality business cards using impressive image designing items. Download ID card designer program develops easy to use, streamline visiting cards, CD labels, ribbons in miscellaneous shapes and size. CD DVD label creator software provides functionality to add photo, text, graphics, logos etc in ID cards, tags as per your business specific needs. Professional CD label builder utility enhanced with impressive graphical user interface (GUI) that requires no technical expertise for accessing software functionality. CD DVD label creator software provides password authentication while designing ID cards, security stickers that helps you to restrict illegal user access. Economical visiting card generator application smoothly runs on all major Windows operating system including Windows XP, 7, Vista series. CD DVD label creator software composes fabulous business cards with the help of line, text, picture, arc, barcode, pencil and other graphical stuffs. 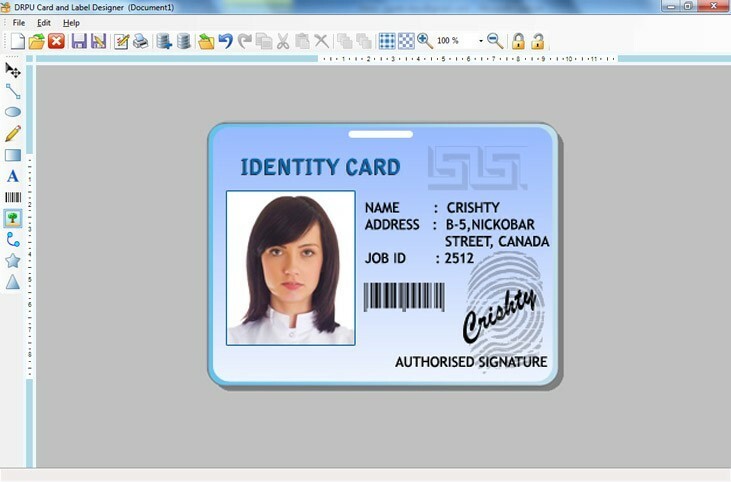 * CD DVD label creator software generates large number of photo ID cards, tags etc using amazing font and page settings. * Powerful business card printing program produces customized audio/video CD, DVD labels in affordable manner. * CD DVD label creator software designs effective stickers, security tags with multicolored background. * Affordable Visiting card designer utility develops user-friendly CD labels in few easiest steps.